GUJCET Results 2014 is declared by GSEB (Gujarat Secondary and Higher Secondary Education Board Education Department - Government of Gujarat). 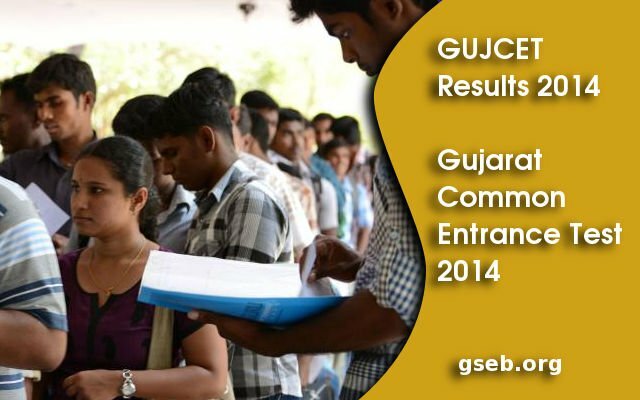 Candidates who appeared for Gujarat Common Entrance Test (GUJCET) can check their results on gseb.org. The entrance was conducted for admissions to B Tech courses and B.E, Medical MBBS, Dental BDS and Pharmacy B Pharma within the state of Gujarat. The Gujarat CET Results 2014 are available on the websites given below. India Results website - http://rslt.indiaresults.com/gj/gujcet/common-entrance-test-result-2014/query.htm. The 6 digit Seat Number is required to check the results. The seat number is written in the Admit Card of GUJCET 2014. Gujarat CET mark sheets are available to the students with their respective scores. There is no reevaluation for GUJCET. The allotment to Engineering and Medical courses are based on the Score in GUJCET. The candidates can apply for the photocopy of the OMR answer sheets though. Admission to Engineering and Medical courses in Gujarat will be based on 60 per cent of the marks obtained by students in Higher Secondary Certificate Examination (Class 12) in the subjects of Physics, Chemistry and Biology and the rest 40 per cent will be based on the total marks obtained in the GUJCET 2014. The mode of writing examinations i.e. the languages are English, Hindi and Gujarati. The entrance examination has three papers, physics, Biology and Mathematics.